More details about the multiple memorandums of understanding that have reportedly become the focus of this week's round of trade talks in Washington leaked Thursday morning, and it more or less confirms previous reports that Beijing is trying to assuage US demands about IP theft and force tech transfers by offering to buy more US agricultural products, which would help narrow the US-China trade deficit and deliver, for Trump, a concrete accomplishment that he could take to his red state voters and rightfully proclaim that "I did this." To that end, one trading desk offered some insight about why these purchases are so important to Trump, even if they won't do much to transform the US economy. Because as long as China buys a few billion dollars more in US agricultural products, the traders said, it won't matter if China goes back to its old ways after the agreement has been reached - because Trump will have achieved his big political win. But buying more soybeans won't help revive America's rusted-out manufacturing base: "It matters for electoral states that matter to trade negotiators, but this nation will not solve the issue of rusted out factories, scattered like tombstones across the across the landscape of our nation, by selling more soybeans." According to Bloomberg, China has proposed that it buy an additional $30 billion of US agricultural products a year, including soybeans, corn and wheat, as part of the trade pact. The offer would be included in one of the memorandums. The purchases would be added to pre-trade war levels of goods for the period covered. In 2017, China imported a total $24.2 billion in American agricultural products, 60% of which was oilseeds, with the remainder including meat, cotton, cereals and seafood. 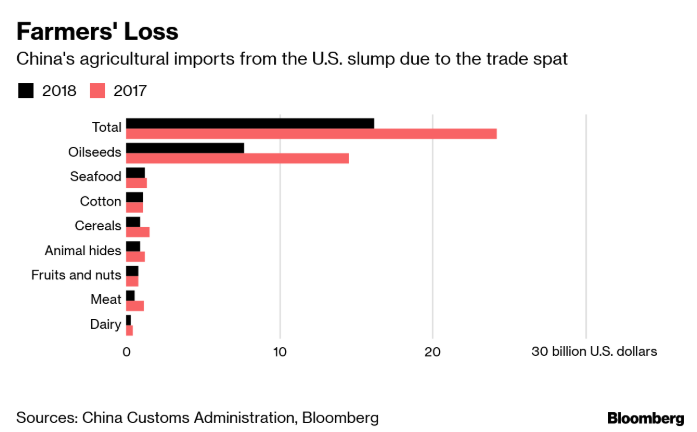 But purchases slumped by one-third to about $16 billion in 2018 - adding to the strains already facing US farmers - as China’s retaliatory tariffs mainly targeted agricultural products. Amid the flurry of reports, Secretary of State Mike Pompeo kept the flow of positive trade headlines going by claiming that talks are making "real progress."